Sacred Games opens with two deaths, one of an animal, the other of a human. The animal is thrown off a building, the woman shot dead. The culprit in both cases seems to be the maniacal Gaitonde, played electrically by Nawazuddin Siddiqui. Instantly, the less than ordinary nature of the antagonist becomes clear, as also the fact that he’s on to something big. A scheme that slowly builds up over the next hour but refuses to reveal itself just yet. On our side is Inspector Sartaj Singh. An honest cop who inherited his sincerity from his father, Sartaj is essentially a self-acknowledged loser, having no successful cases attached to his name. He’s caught in between amoral policemen justifying a juvenile’s encounter on suspicion of terrorist ties, an allegation which Sartaj refutes having been privy to the boy’s pleas for surrender. He returns home to a dried up dingy flat, consumes pills to presumably keep his anxiety or temperament in check and lashes out angrily at his sordid lonesome life. In just two opening scenes, director duo Anurag Kashyap and Vikramaditya Motwane convincingly feed us the show’s flavor and themes. Featuring a short but scintillating intro, the show offers a tantalizing glimpse into the underbelly of Mumbai. It appears the showrunners have managed to shoot in real locations which anyone familiar with the city’s dynamics will tell you, is a laudable feat in itself. That is unless of course, we’re looking at an abundance of seamless visual effects which doesn’t make it any less impressive at all. Most of the episode plays out like an elaborately structured one-sided cat-and-mouse chase between Sartaj and Gaitonde, where the cop is after the criminal. Gaitonde calls up a bewildered Sartaj and begins narrating his life-story, detailing his traumatic trail of events beginning from a troubled childhood with his mother’s cheating followed some ruffled years of youth spent in the company of drugs, gangsters and killings. As he narrates his story, Sartaj uncovers his identity as a notorious convict that has been hiding for over two decades. A fervent Sartaj, believing to have finally landed a case worthy of his merits, gives chase and eventually manages to narrow down his location to a mall which gives rise to an exhilarating climax, almost worthy of a finale in itself. That the antagonist’s past is revealed so extensively in the first episode is counter-intuitive to how most Netflix stories (or perhaps even most stories in general) are structured. There’s generally a long build-up that lasts at least a couple of episodes before things pick up steam. While this debut outing doesn’t move at a feverish pace, it has enough material to leave you flummoxed by the time it has ended. And in classic Netflix binge-watching fashion, it leaves you wanting for more. The show’s technical and production values are flawless and it shows in Netflix’s heavy investment in original content. We’re treated to some stark and gritty views of Mumbai whether its the highways, the singular metro or the open roads so devoid of traffic at night. There’s also a brief segment that takes you back in the past, depicting impressively, the Mumbai of the 70s and 80s spliced with real-life footage of Indira Gandhi and the infamous Emergency (Bombay Velvet would’ve given Kashyap enough experience in handing retro Mumbai to pull it off). The episode rarely meanders around despite its relaxed pacing thanks to Aarti Bajaj’s splendid editing. Normally, even though these are aspects expected from a Netflix production, the Indian nature of the content and production make it worthy of a special mention. After all, how many Indian TV shows can you name besides Anil Kapoor’s 24 that boast of such high-quality work. There’s a visible enigma around Nawazuddin’s character that the actor nails with his cold blank stares. His flashback sequences during his youth quite chillingly convey his emotional dissonance, calculated and menacing abilities. Similarly, Saif Ali Khan portrays a nuanced Sartaj who still seems to hold a lot of secrets close to his chest. The bulk of the episode rests on the interchange between Sartaj and Gaitonde and both actors stay sufficiently restrained in their roles, rarely going overboard. 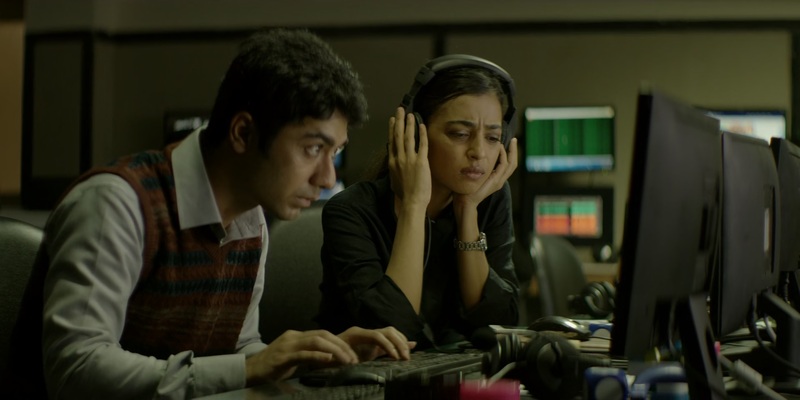 A third player is introduced in the form of Radhika Apte’s mysterious character, supposedly a CBI / CID / RAW agent (the Indian equivalent of an FBI) on the trail of the crime lord who taps into their conversation and inadvertently triggers an already suspicious Gaitonde. I’m surely looking forward to seeing more of her in future episodes as I am deliberating the ways in which the showrunners will unfold more of Gaytonde’s story after that cracker of an ending. On the whole, Sacred Games is off to a visibly strong start and if it maintains this balance between moments and momentum, it’s going to sit well at the top of the pantheon of gripping dramas.